Jesus healed every kind of disease and ever kind of sickness (Matt. 9:35). 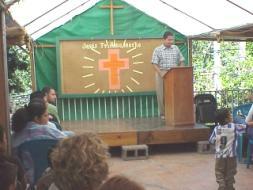 Ministry to the deaf community of Tegucigalpa. Seeing the multitudes, Jesus felt compassion for them, because they were distressed and downcast like sheep without a shepherd  Matthew 9:36. 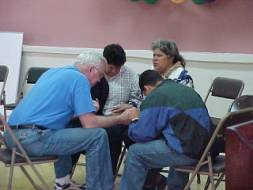 Ministering cross culturally is always a challenge in any new culture. But can you imagine what it would be like to cross three cultures in your attempt to minister to a person? We recently ministered with a medical team to the deaf community in the capital city of Tegucigalpa, Honduras. Through out this week I found myself being a part of a sequence in the translation process. The deaf person used sign language to communicate to a Honduran who understood sign language and spoke to me in Spanish. Then I would translate the Spanish into English for the medical doctor who would then tell me what to say in English so we could reverse the communication process and communicate to the deaf person. 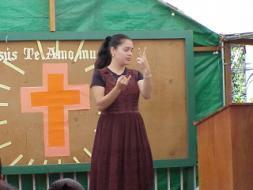 A Honduran woman using sign language in a worship service in a church for deaf people. We began the special medical team ministry by attending a Sunday morning worship service at an evangelical church ministering specifically to the deaf community. 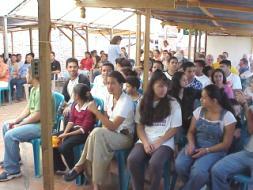 Part of the congregation at the evangelical deaf church. Therefore beseech the Lord of the harvest, to send out workers into His harvest (Matthew 9:38). 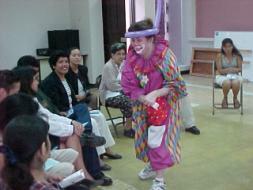 One of the team members clowning it up! Dr. Hilda McGee put together a small team of doctors, nurses, pharmacists, and pastors whose goal was to concentrate on helping the deaf children at the Honduran Children and Family Institute. We had four medical doctors including an ear, nose and throat specialist and four audiologists. 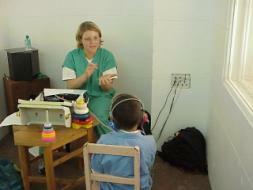 Audiologist testing a child for a hearing aid. Ear, nose and throat specialist examines a patient. Each person who believed on Christ this week was a very special encouragement to the medical team. When Jesus walked on the earth He could reach out and touch the ear and the person could hear. These patients received not only medical treatment, but could hear the voice of God speaking to them through His Spirit. We shared the gospel with 1,106 patients in this special community, and the team prescribed and filled free of charge 3,371 prescriptions, 307 eye glasses, 46 hearing aids, 660 Bibles and New Testaments. Patient praying to receive Jesus Christ as Savior. One of the patients was an 8-month-old child born with a cystic tumor at the base of the brain. These tumors cause increased pressure in the brain and have to be surgically removed. Since this delicate surgery cannot be performed here in Honduras we are working with Cadena de Amor to get her into a hospital in the United States. The harvest is plenteous, but the workers are few (Matthew 9:37). In some cases we provide sponsorship of people for surgery in the U. S. that cannot be performed in Honduras. 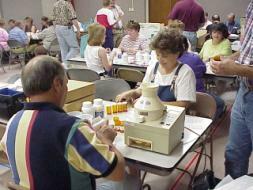 Over 700 volunteers on 26 teams served in 2001. There were 5,813 professions of faith among 40,427 medical patients and 5,375 dental patients. Well over a million dollars of medical services and medicines were provided free of charge to patients. 160,000 prescriptions were filled and over 12,000 Bibles were distributed in addition to thousands of New Testaments, gospels of John, and tracts. These evangelism projects are designed with a clear focus on church planting with Honduran pastors and missionaries in needy towns and villages. 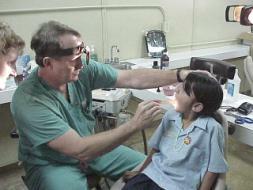 Medical-dental-evangelism teams are at the heart of world missions. When you are on mission with God, He does the work. He uses medicine to open doors that would never open otherwise. Pray that our Honduran staff will be led by the Spirit to the locations where God is at work, and that Team Captains will be alert to the leading of the Holy Spirit for their team. Support a mission team or missionary financially. This is a faith ministry. Each volunteer and mission team depends upon the Lord to provide the financial needs for medicine, food, shipping, translators for doctors, nurses and preachers, etc. When God calls, He provides. Hudson Taylor observed, Gods work, done in Gods way, will receive Gods supply. We have watched Him open doors for teams and then almost startle them by the way He had made it all possible.